Home/ Do You Want FREE Essential Oils????? ​Yes! You can earn high quality essential oils FOR FREE! There are a few programs Young Living offers that you can participate in to “earn” free oils. Young Living offers a rewards program with a new bonus rewards program. They also offer free products each month when you spend a certain amount. They also offer a generous compensation program for people who choose to share oils with others. Young Living offers the Essential Rewards program to wholesale customers as a thank you for being loyal to their brand. (PV = personal volume points, often equal to wholesale price on most consumable products). The Essential Rewards Program rewards you for your loyalty. Whether you just started or have subscribed for over a year, you are well on your way to saving up points! These points can then be used as store credit to purchase products! The longer you are on Essential Rewards, the greater the benefits to you. 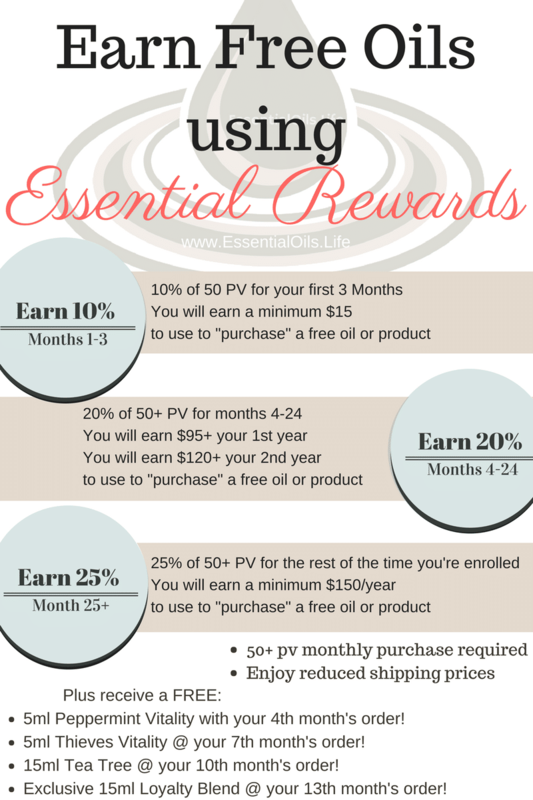 If you purchase 50pv each month on Essential Rewards, you will receive $15+ total for the first 3 months. That would easily cover a new oil! From your 4th month through your second year, you will accrue 20%. That’s $95+ free for your choice of oils just in the first year of using essential rewards! After that, you’ll receive 20% ($120+ total) for your second year on Essential Rewards to put towards free products just for continuing to purchase from Young Living. After your second year, on month 25, you will begin accruing $25% on the PV of your purchases, which puts you at a minimum of receiving $150 in store credit to put towards FREE oils and oil infused products. Of course, as with any rewards program, the more you spend directly correlates to the more you earn! In addition to accumulating points you can cash in for free products, you’ll also be rewarded with loyalty bonuses! Last year (2017), Nicole earned $941 in points and cashed in $967 worth of points total. She likes to cash in her points for self-care items like the Mint Facial Scrub and Lavender Bath Bombs. Each month Young Living announces their promotions for that month. Customers who spend 190, 250, or 300 pv (typically $190, $250, or $300 spent on most oils and products) will automatically receive the applicable free monthly promotion products. *PV is the same as the dollar amount on most products. Be sure to check your totals at the bottom of your order page in your Virtual Office to ensure you’re meeting your PV needs for freebies. Building a business is an opportunity any wholesale customer can take advantage of. Our team provides excellent personalized and FREE support and encouragement to help you every step of the way to achieving your goals. You can earn a generous commission for sharing oils with others to cover the cost of your oils, and then some! Earn 24% sales commissions for retail sales you make, commissions on wholesale customers’ purchases, and performance bonuses too. 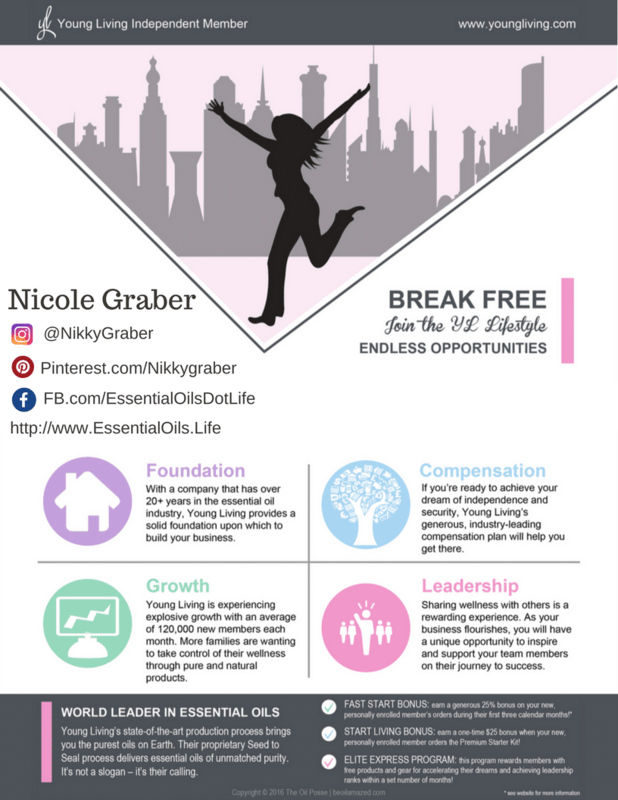 Are you interested in starting an oily business? We have a growing team and are currently looking for motivated individuals to add to our amazing and growing team. Check out the Compensation Plan and the latest earnings disclosure statement to see what each rank earns on average. Then, get started and we will be more than happy to help walk you through building your own oils business and setting you up with our amazingly supportive team! If you’d like some more information, fill out the info below with a message and one of our team members will contact you shortly.